2018 Beach Museum of Art Gift Print and other recent projects. The Beach Museum of Art exhibition unveils the acquisition of Benson’s Waterplaces, a suite of 101 drawings on vellum paper. The exhibition will also present the artist’s 2018 Friends of the Beach Museum of Art Gift Print, Dancing on the Table. This work reflects Benson’s interest in water sources that flow under the ground such as the Ogallala Aquifer in parts of Western Kansas and surrounding states. Benson brings attention to this hidden natural treasure in a chine collé lithograph with gold leaf and coloring applied by hand. 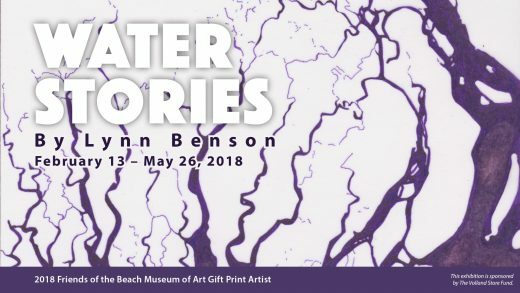 Students will investigate works from the Beach Museum of Art permanent collection related to water by various artists, including Lynn Benson, Herschel Logan, and photographer Jim Richardson. Students will think about Kansas water issues and the environment and learn more about Kansas waterways above and below ground. Discussions will address environmental science standard K-ESS3.